Dine, drink, dance and shop down the North End Road Spring Market on March 17 – with a St Patrick’s Day twist. This popular traffic-free market has more than 150 stalls packed with food and gifts from across the globe, a huge line-up of live music acts and a variety of street entertainment. Simply start at one end and work your way down the historic high street to savour the seasonal produce, fresh fruit and veg, arts and crafts, clothing, fashion accessories and gifts on offer. There’s also the chance to treat your taste buds to a whirlwind tour of exotic cuisines including Caribbean, Ethiopian, Filipino, Italian, Korean, Middle Eastern and Thai. With a nod to St Patrick’s Day, Bridie from Galway (a stilt walking tea lady) will be dropping in for a comical cuppa while classical quartet ZHL will be playing some Irish tunes including Irish Washer Woman and Danny Boy. 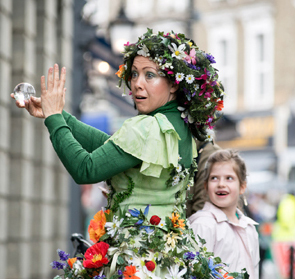 Not to mention, some of London’s finest musicians, singers, buskers and DJs will also be taking part in the green-clad celebrations.